The agreement, which allows the Holy See to influence bishops appointed to mainland China, was signed on 22 September. Whilst the Vatican insists that the agreement is apolitical, some diplomats have indicated that it could be an indication of the Holy See’s intention to favour Beijing over Taiwan in the future. Currently, the Vatican is Taiwan’s last European backer in the claim to recognition of legitimate rule over China and seat on the Security Council. Taiwan accused Beijing of trying to make it “irrelevant” in the world community on Tuesday, after Beijing and the Vatican signed a landmark agreement improving ties. 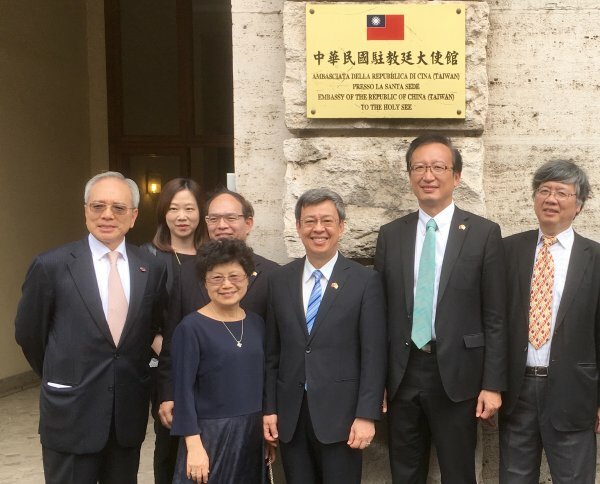 Matthew Lee, Taiwan’s envoy to the Vatican, made the dig in a speech during a reception marking Taiwan’s national day that was attended by Vatican officials, including several directly involved in the negotiations with Beijing. “Communist China remains committed to making the Taiwan people irrelevant to the United Nations and to excluding Taiwan from playing a meaningful role both in the United Nations family and in the international communities,” he said. On September 22, the Vatican and Beijing signed a provisional agreement giving the Holy See a long-desired say in the appointment of bishops in mainland China. In the first concrete sign of a thaw after the signing of the agreement, the Vatican announced on Monday that Beijing would for the first time allow Chinese bishops to attend a major Vatican meeting, known as a synod, that starts on Wednesday. Although the Vatican insists its deal with Beijing is not political – which Lee emphasised in his speech – diplomats say it is likely a precursor to the Vatican eventually switching diplomatic recognition to Beijing. Lee, adopting a Biblical comparison, said Taiwan was David and China was Goliath. “With the assistance of global partners standing up to the rising autocratic authoritarian power [of Beijing] Taiwan will persist, persevere and prevail,” Lee said. But the ranks of those partners has been thinning. The Vatican is Taiwan’s last remaining diplomatic ally in Europe. The self-ruled island has formal relations with 16 other countries, many of them small, less-developed nations in Central America and the Pacific. Taiwan, which Beijing regards as a renegade province, has routinely accused Beijing of using dollar diplomacy and bullying to lure away its allies, charges Beijing has denied. Since the 1970s, following the United Nations vote to recognise the People’s Republic of China as the sole legal China, the Vatican has not appointed a nuncio, or ambassador, to Taiwan. It has since kept the status of its mission in Taipei at the lower level of “charge d’affaires ad interim”, which diplomats say is to placate Beijing. Critics have labelled the agreement between the Vatican and Beijing, which was in the making for more than 10 years, as a sell-out to the communist government. Mainland China’s approximately 12 million Catholics have been split between an underground Church swearing loyalty to the Vatican and the state-supervised Catholic Patriotic Association. Despite the recent agreement, Beijing has not taken any action on long-held Church concerns over clerics in detention, Catholic Church sources familiar with the matter have said.